Two books from two of my favorite authors. What a drag that both were... underwhelming. After a long hiatus away from writing, Harrison burst back into the scene with the well-received and enormously entertaining Dragon Bound, the first book in her Elder Races series. 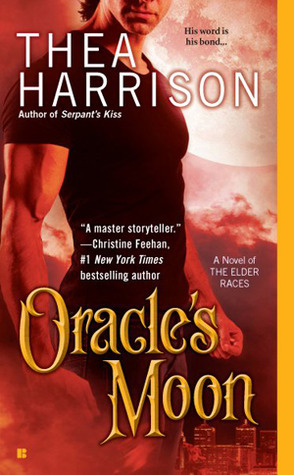 Less than a year later she has released the fourth book in the series, Oracle's Moon, the story of Djinn Khalil and Grace, the newest Oracle. This book has all the hallmarks of a Harrison tale. Super hot hero, feisty heroine, magical hijinks and danger. So why am I meh about it? Maybe because if the supernatural aspect is removed, you're left with a (decently written), Harlequin. Or it could be Grace's niece and nephew, straight out of cute kid central casting, who, improbably and immediately, bonded with the hero, a trope common to romancelandia kids. (Have I mentioned that I am not a fan of kids in books?) Or it could be the hero, an intense, alpha-arrogant, djinn who never transcended the type. The heroine, too, remained a character type, one I feel like I 've read too many times before. 23 years old, she becomes guardian to her young niece and nephew when her sister and husband die in a car accident. She also inherits her sister's power, becoming the new Oracle. This doesn't mean life is rosy. She lives a fairly isolated life, with virtually no emotion support from anyone. She has no one to rely on. She is on the verge of declaring bankruptcy and relies on foodstamps to help feed her family. Along comes super powerful, rich guy and suddenly life starts to get better. The plot was disjointed and the bad guys seemed peripheral to the story, only there to give Khalil a reason to have to save Grace. Moments that should have felt, well, momentous, such as when Grace fully accepted her power or when she is confronted by Khalil's crazy-assed daughter, were anticlimactic. A shame, really because those were events I expected and wanted more from. The book wasn't dull but it also wasn't particularly engaging. Like I said, take away the supernatural aspect and this could have been a category romance, not terrible but nothing to write home about either. The next book is supposed to revolve around Pia and Dragos, from book one, so hopefully, the series will return to its former level. This is the final book in the Connor Grey series and one I have been anxiously awaiting. Finally, a series that actually ends and gives some resolution instead of stringing the reader along with never ending adventures of the paranormal kind. (I like my series, I do, but at some point, a girl needs some closure.) I'm ambivalent about this book, though. It's not Del Franco's best effort. A majority of the book is spent with Connor laying low, as he is now considered a terrorist, and rehashing things that occurred in the previous novels. And, somehow, Connor manages to get kidnapped three times so I guess he's not that good at hiding out. We meet Connors parents for what solely seems to be a chance for them to impart some crucial information about Connor's past; there's no other reason for them to be in the book and they add little too the story. The book wraps things up in the end but, I have to tell ya, I'm not sure I completely understood what happened. I mean, I understood the events but not what they meant. I cannot say that I was disappointed; I'd have to have understood the book better to be disappointed. I will say that one of the appealing things to me about the Connor Grey series was how nicely paced each book was. Unfortunately, the pacing was off in Undone Deeds. A bummer since it was the last book and I wanted to end the series on a high note. We do get some answers in this book but, ultimately, I was left feeling unsatisfied. There was a lack of cohesion to the story and I was left confused by the end. I have read other reviews that say that if you are knowledgable about Arthurian legends, the end makes much more sense. I have a fair amount of knowledge but I still didn't get it. This is exactly how I felt when I've finished this book. I hate, when good, logical set-up (and even if there is a lot of magic involved in books everything were logical) and on the end: BOOM, it's all MISTIC. English isn't my first language, so this might be a problem: too many metaphors, allegories and mystical stuff... still, I did recognized many of them, but didn't understand epilogue at all... Well, It didn't felt like ending at all. And all the "twists" Del Franco just throw at the reader at the second half of book... He introduced a lot of new stuff, but didn't resolved many of old ones: for example: what with Nigel? Why he tried to kill Meryl? What happened to him? I love Del Franco style, I love all Connor Grey books, but this one (especially ending) was really disappointing.